One way to look at an accordion is like a collapsed single column of a table. I was recently building a page for a client site, where the information that they provided really made sense to present as a table. But it was too much information to view all at once. I thought it would have been overwhelming visually. I also thought that it was most likely that people visiting this page would know what they needed right away, so having them click once to get it seemed pretty reasonable. So, a table of accordions! Another consideration in this table I was building is that there was enough columns that each individual column (should they have been equal width in the space available) wasn't very wide, maybe 150px. Some of these cells contained several paragraphs of text. A cell 150px wide with several paragraphs of text would awkwardly tall. Hence, the Grid Accordion is born! The Grid Accordion works with the same theory as most other accordions. Only one cell is open at a time. The big thing is that the column of the current open cell expands to a reasonable reading width. You can view and download the example at the end of this article. I'll go through some of the important bits next. 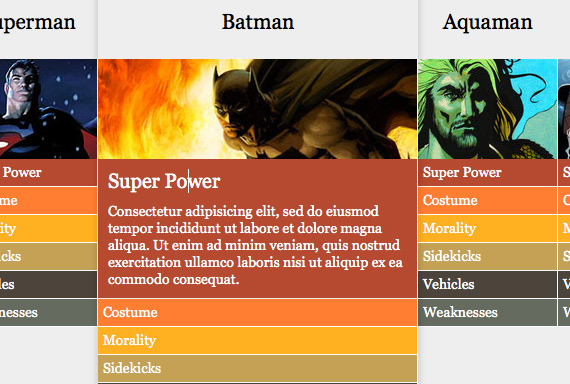 Most of the CSS is just simple setup and not really worth covering here (full CSS file here). One aspect that is worth covering those is accessibility. We need to "hide" all the information panels of the table by default. 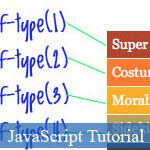 One of the ways we could do that is to set the dd elements to display: none; in the CSS. This is a seriously accessibility problems though, as many screen readers will obey that CSS and completely remove that information. Instead, we can "hide" the cells by just kicking them outside the browser window. The thing about the slideDown jQuery function is that it works best when it already knows what height the element originally was before it was closed or hidden, so it can smoothly animate itself back to that original height. 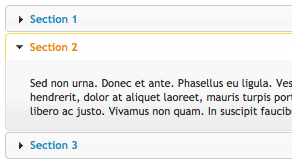 If we used display: none; in the CSS, this function would have no idea how tall those cells are supposed to be. Kicking them off the page instead means that the original height will be calculated, keeping that animation as smooth as it can be. We just need to make sure that the cell is set to its "full" width so the height is calculated at the width the cell will be when it's visible. For the rabble-rabble-IE-compatibility crowd, go ahead and add extra class names to the cells and do your coloring with those hooks. While I was playing with this, I originally tried using some transforms to scale up the size of the current column. Ultimately I didn't like the look (one pixel lines look awful when scaled). I liked the shadows much better, but I found that the right edge of the shadow was being cut off the the next column. It was because that next column sat slightly above the current one in terms of vertical stacking order. Hence, the curCol class having the z-index and relative positioning, to make sure it sits on top of the others. Randomly, I also discovered that the transform property also solved the problem. As in, setting -moz-transform: scale(1); (which scales something to 100%, or basically, does nothing to unscaled elements) also worked by making the shadow visible. In other words: using transforms on elements affects their vertical stacking order. I'm just not sure how it all works exactly quite yet. Where live would have to watch the entire document for clicks, delegate limits that watching to only the page-wrap, which is more efficient. Until I figure out some good licensing system... just a reminder than any downloadable example like this on this site you can use to do whatever you want with. Preferably, use it in big corporate projects and make boat loads of cash. Or, show it to your friends and tell them you did it so they will think you are awesome.